The IAA’s annual Investment Adviser Compliance Conference is a comprehensive two-day program that provides investment advisers with the most current information available on the changing regulatory landscape. Participants return to their firms with practical insights and knowledge of best practices to help them maintain a successful compliance program. In addition to meeting and interacting with peers, attendees will hear from a distinguished roster of speakers that includes SEC staff, investment adviser industry professionals, and legal experts. The conference covers a wide range of compliance issues, both in plenary sessions and in numerous breakout sessions. Video recordings of all breakout sessions are available after the conference exclusively to conference attendees. The conference is approved for NRS Investment Adviser Certified Compliance Professional® (IACCP®) continuing education credit. It is also approved for CLE credit and for NASBA CPE credit. Keynote Conversation with SEC Commissioner Robert J. Jackson, Jr.
Register by January 18 to take advantage of the early registration discount. *Individuals employed by an IAA member or associate member firm in good standing, both at the time of registration and on the date of the event, are eligible to receive the appropriate discounted member/associate member rate. Regulators: A discounted conference registration fee for federal and state regulators is available. Contact the IAA at (202) 293-4222 for information. If unable to attend, registrants are welcome to send a substitute for no additional fee. Cancellations must be received in writing. There is a $100 cancellation fee if cancellation is received on or before February 28, 2019. No refunds or credit is given for cancellations received on or after March 1, 2019. There are no refunds for “no shows.” For questions or more information regarding refunds, concerns, and program cancellation policies, please contact the IAA at (202) 293-4222. CLE, IACCP, and NASBA CPE Credit Available. Click here for details. 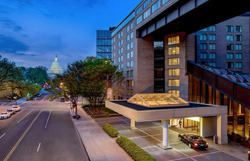 The IAA Investment Adviser Compliance Conference takes place at the Hyatt Regency Washington on Capitol Hill in Washington, DC. Conference attendees are responsible for making their own hotel arrangements. A block of rooms has been reserved at the Hyatt Regency Washington at a special rate of $295 plus tax per night. Place a reservation by contacting a Hyatt reservation agent at 877-803-7534, or click hotel reservations. Mention the IAA Compliance Conference to receive the special rate. The group rate is available until Wednesday, February 20, 2019, or until the room block is filled. Make a room reservation early to ensure group rate availability. For more information about the Compliance Conference, contact IAA Director of Meetings & Events Lisa Gillette at (202) 293-4222 or at lisa.gillette@investmentadviser.org.